The first thing I wondered as we (Rebecca and I, as we both were invited to the Michelin Ride & Drive Event) were being driven in a limousine to the Estérel Suites, Spa & Lac Hôtel in Estérel, Quebec, was “where the hell is Estérel?!. You’ll see, much as I know some of the basic Quebec, I am totally at a loss with its geography. My former intern Anabelle had told me a little bit about the Laurentides (the Laurentian Mountains), but I knew very little otherwise. 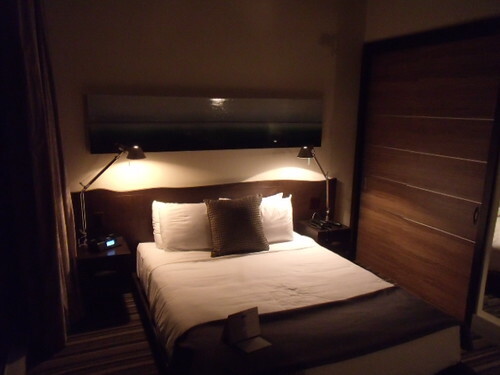 So, I wasn’t prepared to see a hotel of the caliber of the Estérel Suites, Spa & Lac. And given how the hotel was specifically redecorated to the Michelin event, it was even more impressive. To tell you one thing: the digital cards were reprinted with the Michelin logo, and the elevator doors had the Michelin logo too. Yeah. LIKE THAT. And the decoration was top-notch. Frankly, it was like being in a luxury apartment. 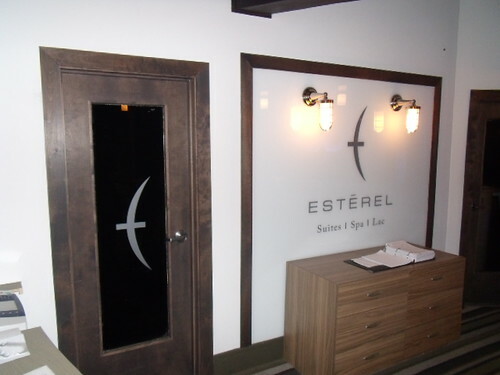 Discover the new face of Estérel suites, spa & lac. This iconic Laurentian retreat underwent a major transformation to bring you the best hotel and resort experiences. Located on the shore of Lake Dupuis, Estérel suites, spa & lac offers you 95 bright and elegant suites equipped with modern fireplaces. 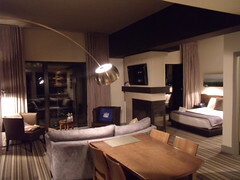 Some suites provide you with a beautiful garden view and some with spectacular lake views. There are even a few with direct beach access. The dining room has been completely revamped and with the new wine bar, we promise you an unparallel adventure in an inviting atmosphere, chic design, combining natural lighting and floor-to-ceiling windows overlooking the lake. At Estérel suites, spa & lac, we offer you a wide choice of packages that best meet your areas of interest: gastronomy, business, golf or a variety of seasonal outdoor activities. This setting undoubtedly offers the perfect getaway for every traveler. Let your worries flow away and discover a sanctuary of harmony and serenity. 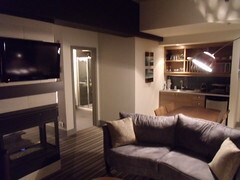 The suite was WAY bigger than my own apartment, and completely self-contained. It’s clear that the Estérel Suites, Spa & Lac Hôtel does not take lightly their mission and goal of providing serenity and relaxation and the best in a resort experience. I can tell you I did NOT want to leave. We did not have the time to explore the rest, but I now know where I’m going to go away for a week if I decide to write a book! It’s not a short distance from the Montreal Airport (Pierre Trudeau) but just from my experience, if you are a ski or winter sports fiend, this may very well be the place for you. Take Laurentides highway (15 north) until exit 69 toward Sainte-Marguerite/Estérel and take chemin Pierre Péladeau (route 370 east). Continue to follow chemin Pierre Péladeau (route 370 east) for about 12 km and turn right onto chemin Masson (route 370 east). Continue about 2,4 km and then turn left to stay on route 370 east toward Estérel. The hotel will be at about 600 m on the right. You can find them on Facebook too. I have to say, this was an amazing choice host hotel by Michelin, definitely. Disclosure: My stay at the Estérel Suites, Spa & Lac Hôtel was covered by Michelin as part of the Ride and Drive media trip. At no point did Michelin (or the Estérel Suites, Spa & Lac Hôtel) require me to write a review, but I think it’s worth showcasing that Quebec has some high-end hotels that are simply spectacular. As always I retain full editorial control over what I post on my blog. The Laurentides are pretty much the Québec equivalent of Whistler (well, that’s Tremblant, but anything in the vicinity too). It’s full of upscale hotels, resorts and retreats. You were treated well it seems!